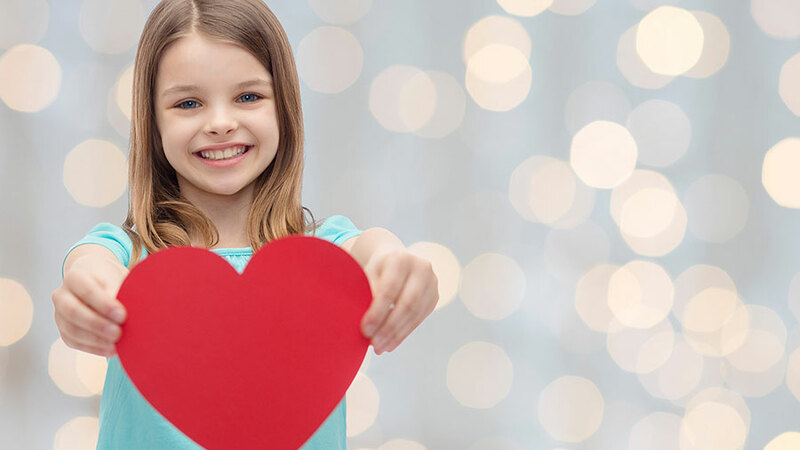 Valentine’s Day is here, and that is why we are bringing you 10 Valentine’s Day Teaching Resources for you to use with your kids! We all love the candy, parties, and sweet little Valentine’s cards that are passed around. I guess some of you find it a great excuse to wear pink for two weeks straight! I still love the idea of making old-school brown paper bag mailboxes and taping them to the front of each child’s desk. Some of you may have upgraded to using file folders, but those just don’t make the same crinkly sounds that the brown bags make. To help you celebrate V-Day, we are here to give you 10 Valentine’s Day Teaching Resources for you to use in your classroom. We will provide you with links to our favorite Valentine’s Day teaching resources, including worksheets, activity centers, flash cards, coloring pages, and more. Also, if you want to be prepared for every major holiday, be sure to Sign up for Access to get resources for all the major holidays. Valentine’s Day Desk Name Tags: Make your desks colorful and fun! Valentine’s Day Flash Cards Word List: Heart, Cupid, Red, Pink, White, Arrow, Candy, Card, Teddy Bear, Friends, Love, Flowers, Chocolate, February, Dinner, Dove, Hug, Kiss, Rose, Gift, Balloons, Bouquet, Mom, Dad. This Valentine’s Day Theme Mini-Pack Download includes 10 Valentine’s Day Worksheets and 2 Valentine’s Day Activities perfect for your classroom. 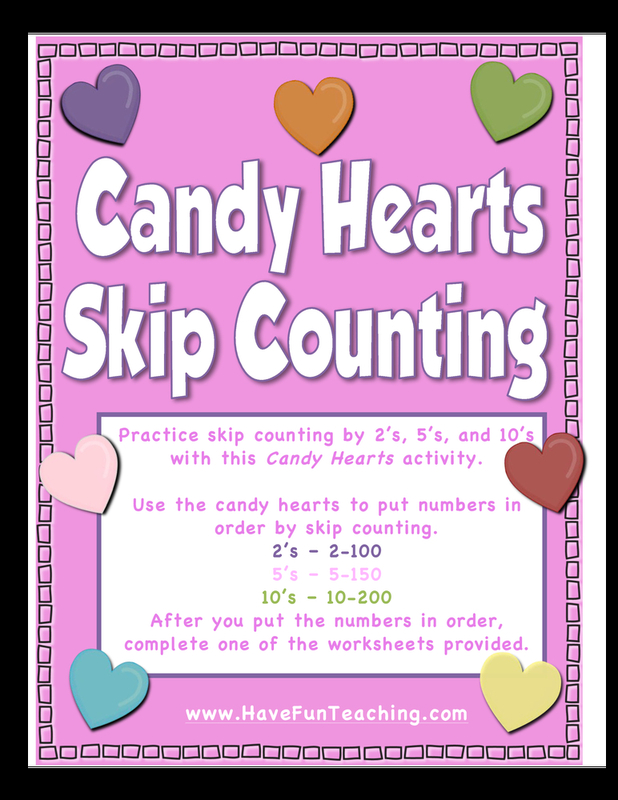 Candy Hearts Skip Counting Activity: Practice skip counting by 2’s, 5’s, and 10’s with this Candy Hearts activity. Use the candy hearts to put numbers in order by skip counting. After you put the numbers in order, complete one of the worksheets provided. 2’s: 2-100, 5’s: 5-150, and 10’s: 10-200. An alphabetical order sorting worksheet with a Valentine’s Day theme. Vocabulary words include: hearts, love, candy, friend, cupid, chocolate, cards, hug, red, pink. 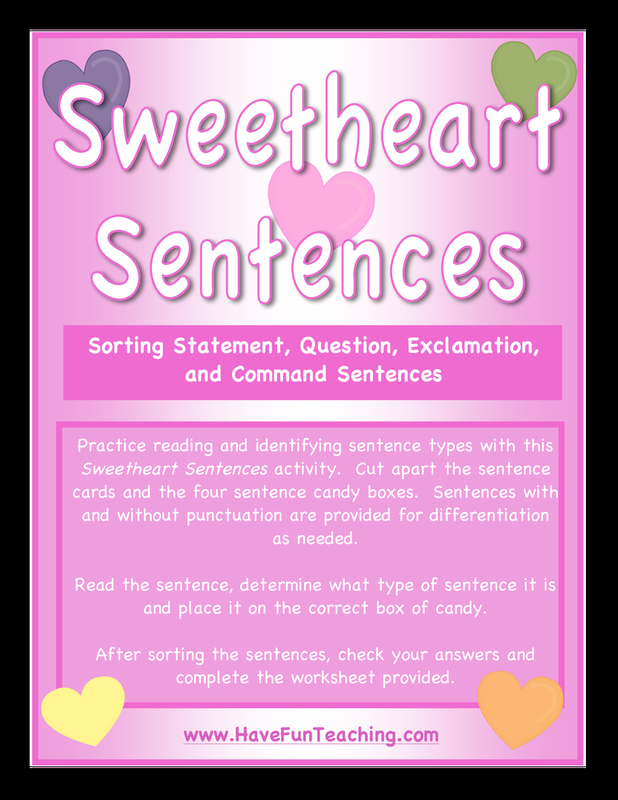 Practice reading and identifying sentence types with this Sweetheart Sentences activity. Cut apart the sentence cards and the four sentence candy boxes. Sentences with and without punctuation are provided for differentiation as needed. Read the sentence, determine what type of sentence it is and place it on the correct box of candy. After sorting the sentences, check your answers and complete the worksheet provided. Make a bar graph about colored candy hearts to practice your math skills in a Valentine’s Day themed way! Oh yeah, you can’t forget the Valentine’s Day Coloring! You can also use these for extension activities, such as having your students color the picture, then write and story on the back. 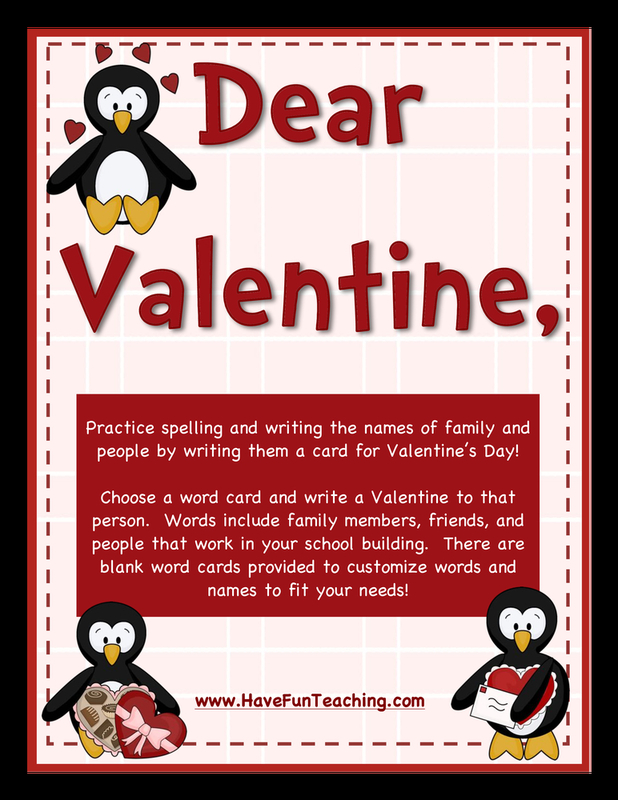 Or, color the Valentine’s Day picture, then write on the back as many vocabulary words as you can create! Your kids are going to love these Valentine’s Day Teaching Resources! Holidays Reading Comprehension Workbook – This collection includes 20 Reading Comprehension Stories that showcase important holidays. This workbook includes stories about Grandparents Day, Halloween, Thanksgiving, Christmas, New Year’s, Martin Luther King Jr. Day, Groundhog Day, Valentine’s Day, Presidents Day, Read Across America Day, St. Patrick’s Day, Easter, April Fool’s Day, Earth Day, Mother’s Day, Memorial Day, Father’s Day, and Independence Day. Have Fun Teaching Access – Have Fun Teaching Access is a monthly subscription that gives you Monday-Friday teaching resources that are Ready-To-Use and Common Core Aligned for every weekday of the year. With Access, you will have Members-Only access to high quality teaching materials, lesson plans, worksheets, activities, songs, videos, assessments, holiday themed lessons, and Common Core materials for every weekday of the year.